When you get contacted and asked if you want a hamper for your littles, you say yes like me, particularly when you need some cheering up! But, first things first this is NOT a sponsored post and I have not been paid to write this post & this post does not contain affiliate links. However, these items were kindly gifted in exchange for possible coverage on the blog. Now that that's out of the way I can continue! I am sharing because I actually love some of the things that were sent and am pleased to to have been introduced to new innovative brands that I would have possibly never known about. I have also been using the items for over a week now so I can actually give honest mini reviews. Pigeon Organics - Ahhhh my favourite from the bunch, a great ethical and organic brand that's made in the UK. They sent Esra a dress which she wore immediately, and another 3 times already. The beautiful cotton is great quality and soft to touch, the design and colours remind me a little of 'Joules' with its classic yet simple textile design. Adem's sleep suit is a gorgeous woodland print with asymmetric poppers, I love that you can fold the foot section over and have his feet sticking out as don't babies just seem to grow out of them in literally 2 weeks, this way they last so much longer. This is definitely a brand I will look into for the future, they sent a catalogue and I have my eye on a few things for Autumn. 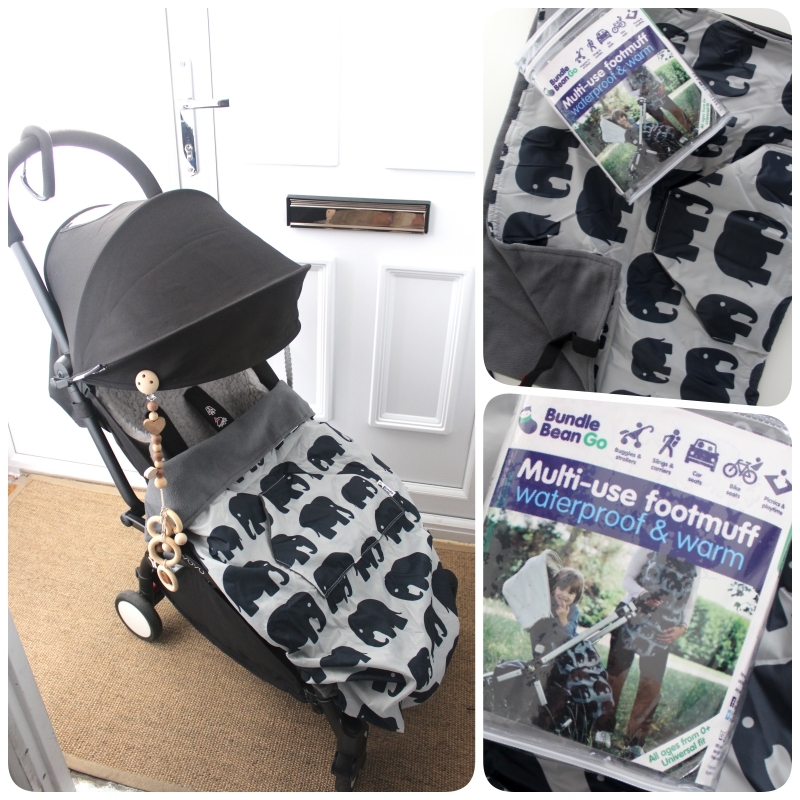 Bundle And Bean Multi Use Footmuff - When I first saw this I couldn't figure out how it worked or if it would actually be of any use, but it's actually a genius product. It rolls up so small and has an adjustable velcro strap at the back so therefore fits on everything from a buggy to a car seat and apparently even a carrier. I basically chucked this under the buggy and of course the wind in London is aways in full swing and I took it out on a windy day instead of a blanket and I absolutely LOVE the velcro feature as it prevents it from flying away and keeps my little man nice and warm. I also have a footmuff but it's quite bulky and more suitable for Winter. This is perfect for Summer, rolls up nice and small and you can even use it to sit on at the park as an emergency play mat. Priced at £29.99 it's not too bad and well worth the money. It's also available in many different designs, CLICK HERE to see more and quote 'BUBBLEGARM' for 15% off. BABEASE - Who doesn't love pouch food for on the go? I do as they are so convenient for when you are in a panic and out and about. Babease specifically do vegetable based ones which I love as other brands do a mixture of meat and fruit and when you look at the ingredients it's like 2% of something rather than 50%. Adem is 9 months old now and eating mainly whatever I cook. However, if something I've made isn't suitable I will use a pouch, sometimes I have even used them as pasta sauce too. He really loved the quinoa + beetroot & pumpkin and pea flavour but wasn't too keen on the chickpea version. I will definitely be purchasing more of these just to have as backup, they are available in Tesco's and Boots and a few other places. If you go to their website you can fill in a form to get a free sample which is awesome. FrezyDerm - I'm quite strict with sticking to using only the Weleda Calendula baby shampoo but, I tried this and it was actually really pleasant. The scent kind of reminded me of Mustela products, it caused no irritations or tears as it's PH level is 7.1 compatible and paraben free. It also has a nifty dispenser that I like & I can definitely see myself repurchasing. The magic spray has a nice scent but didn't do anything extra than a standard detangler. I prefer to use 'Nitty Gritty' on Esra's hair as its quite long and repels any nits she may attract from school (yes I am OCD and spray it a lot) and also does a good job of detangling. Get Fruity Bars - These are yummy oat bars that I have been keeping in my bag for when Esra or even me need a quick nutritious snack. They are gluten free and vegan. These make a nice change from the nut bars and contain only fruit, oats and virgin coconut oil. A perfect 'Elevenses' snack with coffee that you can share with your little one. Available from Waitrose, Tesco & Ocado - Use Code 'FRUITY17' for 20% discount on their website. Start Rite - I love the T bar shoes from Start rite and will be getting Esra THESE in either navy or pink with the £50 voucher I was sent. I just haven't had a chance to go to a store and get them yet thanks to Ramadan and half term. Bria Organics - 100% natural skin balm for eczema and dry skin conditions containing organic borage oil, rose hip oil, chickweed oil and beeswax. This was handmade by a mum in the UK and now sold worldwide. This is very handy for the handbag as I have it in a small size to soothe baby soft skin and even perfect for my dry mama chapped hands. I keep this in my bag and it's been perfect for Adem's dry cheeks and even my cuticles. A much nicer alternative than just using plain coconut oil which I normally do. Quote 'FREED3' for free delivery on their website. Little Butterfly London - The packaging on this brand just speaks volumes, It has mint green wooden lids, glass jars, all organic and what more can I say... If ever a nappy change product needed to be on display, then this brand has it. They also won gold last year for 'The Green Parent' awards and I'm not at all surprised why. the nappy change cream has been an excellent barrier and prevented any sort of rash. I still like my Selena calendula nappy cream but this just gets top marks because of the packaging. The baby massage oil is so really lovely too and the sweet orange scent is really soothing. 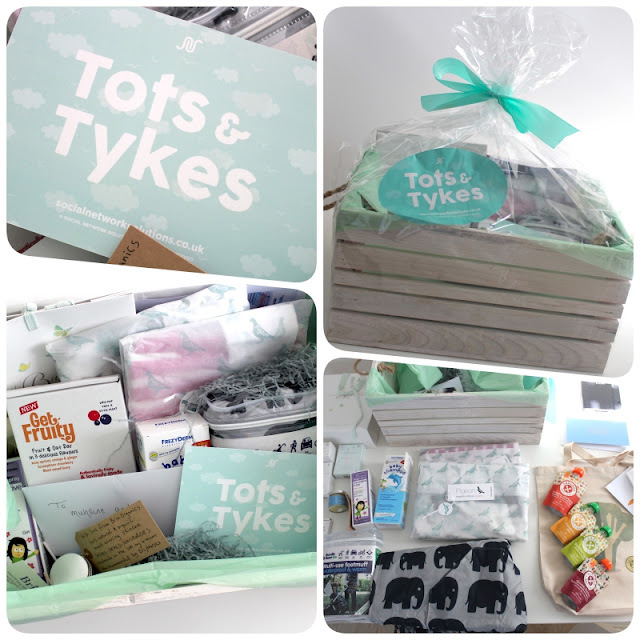 This brand has some lovely products and would make the perfect gift to someone who is expecting for their baby shower. Quote 'MUHSINE15LBL' for 15% off. Tiddlers And Nippers - Ok so I'm organised but not too sure about this. It's a notebook to track weaning, basically there are sections for EVERYTHING, what foods they ate, what times, amount of milk, what kind of milk etc... 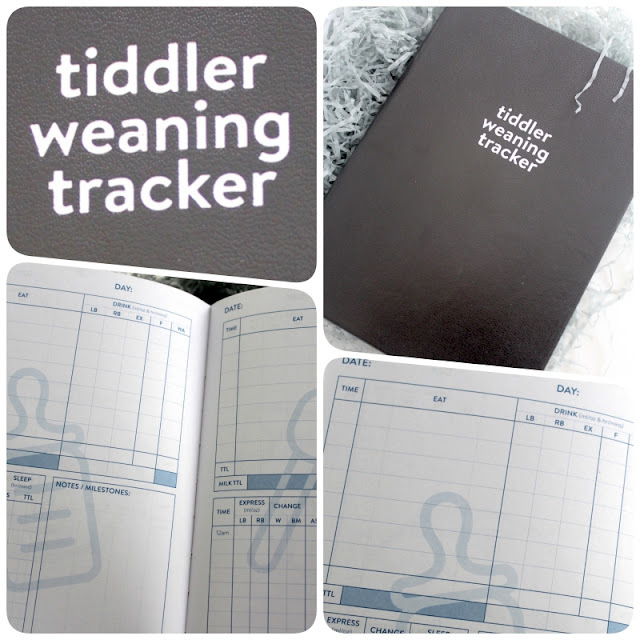 But, this isn't for me, but if you know somebody who is super organised and would even want to somehow track everything to do with weaning (possibly a first time parent) then this could be a great gift. But, sadly for me this is something I will pass on but it's a great quality heavy notebook if you are wondering. They also have other designs, so worth a look! Wow, that was a lot! But I hope you enjoyed reading as much as I enjoyed writing up the little reviews. It's always nice to receive a little hamper, and such a treat for a mama to be or a new mum. What was your favourite from the bunch? 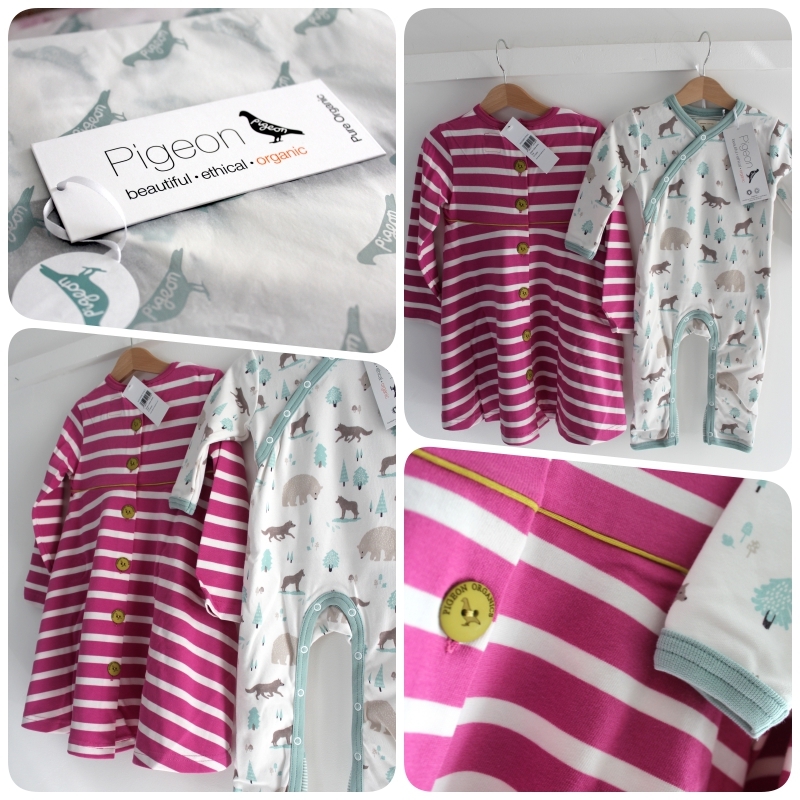 Mine was the clothes by Pigeon Organics as well as the Bundle and Bean footmuff that I can't be without now.